This Wednesday aerial photo shows flooding near the Platte River in in Plattsmouth, Neb., south of Omaha. Heavy rainfall and rapid snowmelt have caused catastrophic flooding across the Missouri River Basin, and three-fourths of Nebraska's 93 counties have declared an emergency, Gov. Pete Ricketts said. The cost of the damage has surpassed $1.3 billion, state officials said, according to The Associated Press. That includes $449 million in damage to roads, levees and other infrastructure; $440 million in crop losses; and $400 million in cattle losses. 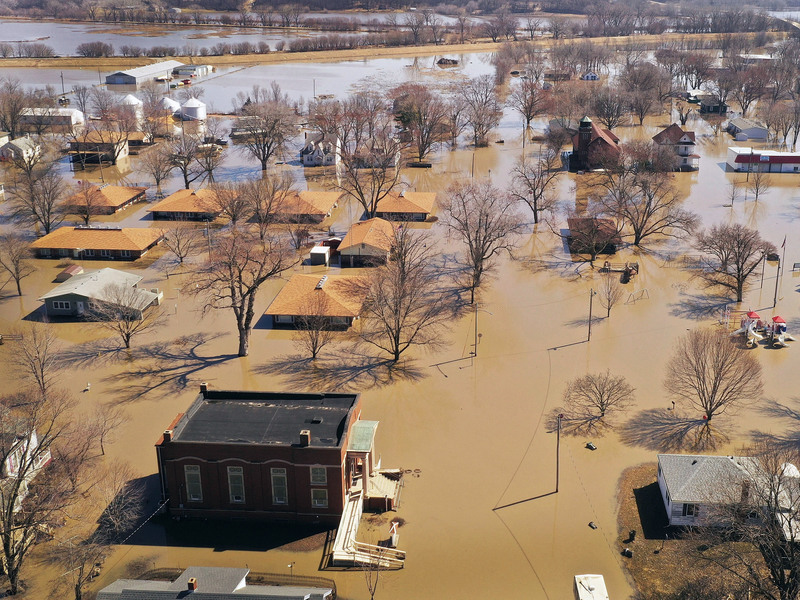 Ricketts estimated that more than 2,000 homes and 340 businesses were damaged or destroyed by the flood, at a cost of $85 million. The state is seeking a federal disaster declaration, which would quickly free up funds from the Federal Emergency Management Agency. Ricketts spoke with Vice President Pence this week to discuss the flood damage. In the phone call, Pence told the president "it was some of the worst flooding he had ever seen in his life," Ricketts relayed to reporters. "I think that will help the president make the decision to sign that disaster declaration." Homes and businesses are surrounded by floodwater Wednesday in Hamburg, Iowa. Ricketts said that, in terms of how many places have been affected by the flooding, "I don't think there's ever been a disaster this widespread in Nebraska." In Iowa, treatment plants shut down and left residents of two cities without fresh water, the AP reported. Iowa Gov. Kim Reynolds said she would also be asking President Trump for an expedited disaster declaration. 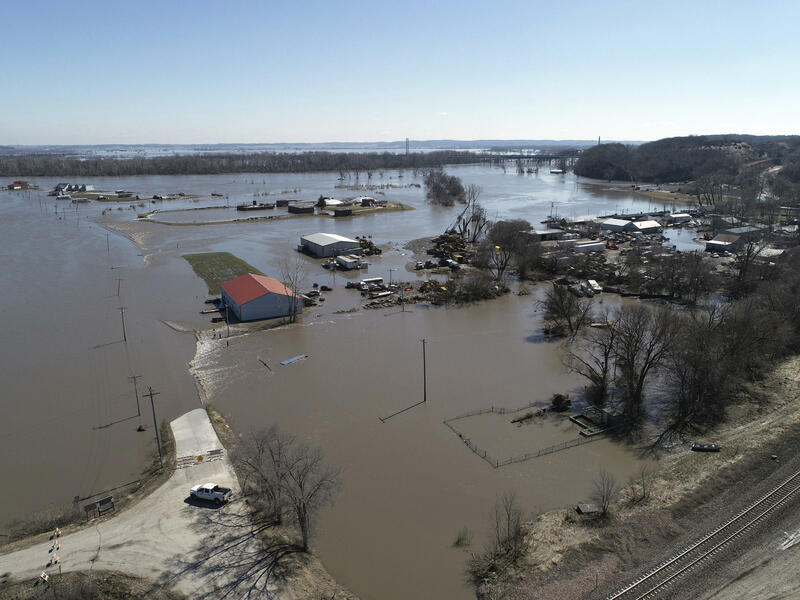 The National Weather Service says that "major to historic river flooding" will continue across parts of the Mississippi and Missouri river basins. Flooding is also a threat across parts of the Northwest and Northern Plains as well, the National Weather Service said.